There’s a lot more to these multi-pocket travel jackets and sweatshirts than meets the eye—literally. There are 15 built-in features (and plenty of pockets) that stealthily streamline traveling and free up hands. 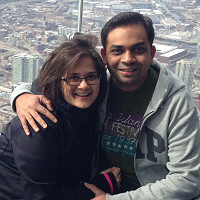 The durable multi-taskers are the creation of Hiral Sanghavi and Yoganshi Shah. Hiral was cycling through neck pillows at a high rate—nine in three months—so Yoganshi thought up a jacket design with a built-in pillow. From there, the couple kept solving as many travel problems as they could in one jacket—without adding unwanted bulk. So their designs include an eye mask, integrated gloves, a stylus-pen-combo in the zipper, and designated pockets for tablets, phones, drinks, and more. The travelers among us were impressed with the functionality of the lightweight rain jacket and the cozy (but not boxy) sweatshirt. The best part? Discovering a new hidden feature each day. 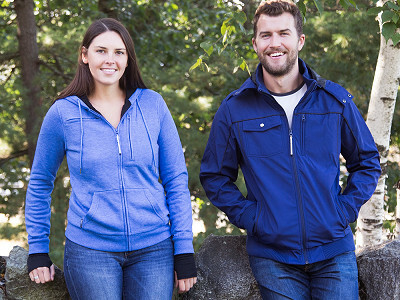 Hello everyone, I'm proud to introduce Baubax, the ultimate travel jackets to The Grommet! I'd be happy to answer any questions you may have! @Debbie Hi Debbie! Yes. You can find a size chart under the Details section for each jacket. Please make sure to check the size chart before ordering to get the best fit. Thank you for your question! I see that in the Windbreaker your sizes only go to Large for woman, and the others only to XXL. 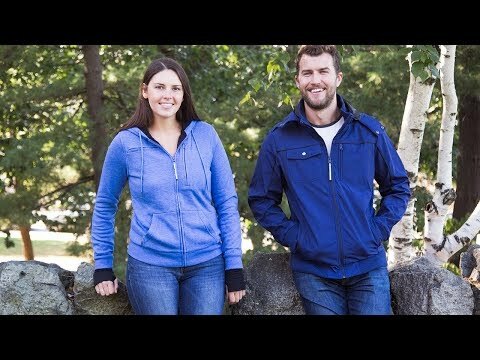 Do you have a time frame to be offering these jackets for Plus Size women? @Judy I had same question. After reviewing, I checked the men's items and it appears they are so similar one could not tell the difference between the two. I'd say it's fairly likely we could get a men's jacket as they have much more generous sizes available. @Candy Hi Candy! Yes, I would agree with your comments above. The arms will be a little bit longer with the men's jackets but you will have more room in the waist...etc. I usually wear a size 14 or XL in my jackets and have an XL for men's in the sweatshirt and XL in men's in the windbreaker and they both fit great! @Judy Hi Judy! Unfortunately, the larger sizes for women, the XL and 2XL are out of stock.However, I usually wear an XL in women's and instead ordered a Men's XL and that worked for me. That might be an option for you as well. Please refer to the size chart to see what will work best for you. Are the bomber jackets water resistant? @Karin Hi Karin! Yes, our bomber jackets are water-resistant. One of our employees recently got caught in a downpour here in the Washington state (which is quite common) and said he was glad he had his bomber jacket on! Sorry, another question...... Are these machine washable? What is the recommended cleaning method? Also, thanks for the mens sizes as a recommendation. Unfortunately, it appears that the mens Bomber Jacket doesn't come in that pretty lighter blue, but the Windbreaker does. @Judy Yes. All the jackets are machine washable. Sorry that we do not carry the color you are looking for maybe we will have a new color that you like next year...stay tuned! Hi, I saw that red was the only option for the XL size of the Men's Travel Windbreaker. Is that the only color made in that size? Are the other colors temporarily out of stock? I like the jacket, but would purchase blue or black. @Jay Hi Jay! Yes, unfortunately the XL is out of stock in the other colors right now. However, please feel free to reach out to the friendly customer service staff at The Grommet for any future updates. Does not come in plus sizes. Half of women in US are over size 14. You are missing sales. @Barb Hi Barb! Because we do not currently offer plus sizes for women, we recommend looking at the sizing chart for the men's jackets. My female colleague wears a size 18-20 and ordered the XL men's windbreaker and was very happy with the fit. @Carol Hi Carol! Lucky you! Even though our bomber is not technically waterproof it will still keep you warm and dry in very cold or wet climates. Our company is headquarter in a very wet climate, Washington state, and our bombers work really well here. Hi Ann, What type of blanket fits in the blanket pocket? What size blanket? @Wendy Hi Wendy! I would recommend a lightweight blanket that would normally find on most airlines. Traveling to Thailand where it is still warm but may need something light at night. Would you recommend the windbreaker or sweatshirt? @Elaine Hi Elaine! I would definitely recommend our windbreakers for your trip to Thailand. I would order a size larger than you normally wear so you can add a layer for extra warmth. Safe travels! Is the fit of the sweatshirt true to size? Is it a relaxed fit or more slim/fitted? @Renee Hi Renee! The sweatshirt is true to size if you go off the dimensions on the sizing chart. There’s a lot more to these multi-pocket travel jackets and sweatshirts than meets the eye—literally. There are 15 built-in features (and plenty of pockets) that stealthily streamline traveling and free up hands. The durable multi-taskers are the creation of Hiral Sanghavi and Yoganshi Shah. Hiral was cycling through neck pillows at a high rate—nine in three months—so Yoganshi thought up a jacket design with a built-in pillow. From there, the couple kept solving as many travel problems as they could in one jacket—without adding unwanted bulk. So their designs include an eye mask, integrated gloves, a stylus-pen-combo in the zipper, and designated pockets for tablets, phones, drinks, and more.